Author: Reg Down Age Range: 6-10 yrs A color picture book from The Tales of Tiptoes Lightly For years my readers have been telling me that I should illustrate my books in color. Well folks, here is the first adventure from The Tales of Tiptoes Lightly. The Bee who Lost his Buzz follows Tiptoes and Jeremy Mouse as they help the Bee whose buzz has been snagged by grumpy Mr. Cactus. Then, after Pine Cone and Pepper Pot the gnomes unplug the apple that’s stuck in Ompliant the Elephant’s trunk, Tiptoes helps the Worm who has lost his squirm and cannot wiggle back into the safety of his home under the ground. Later, along with the red-capped gnomes, they sail down Running River to the ocean to help little Octopus untangle his legs. He’s too young to count them properly (he can only count to seven), and whenever he tries gets them hopelessly mixed up. 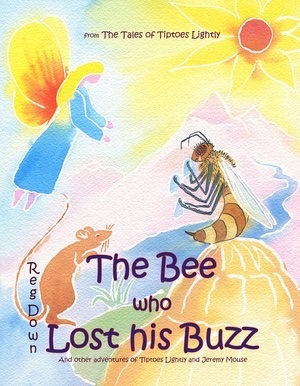 The Bee who Lost his Buzz is an innocent and magical tale suitable for reading to young children or for young children to read. 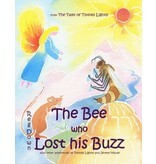 It is an ideal book for children from preschool through grade one or two. Sample illustrations. Color Picture book, 8 x 10, soft cover, 40 pages. Also available in Spanish and German.